Data Truck Pro-Installed Internet Service. Data Truck Pro-Installed Internet Service is delivered to you using the latest wireless technology and microwave radio signals. We install a small receiving antenna on the roof using a tripod, the side of a building, or on a nearby support structure. The antenna needs to be within line-of-sight of one of our transmitting towers. Using rugged outdoor cable, we connect the antenna to our modem inside your home or office. The modem connects to your computer, wi-fi router, or existing network. Certain locations may require a non-standard installation such as a tower, high-gain antenna, or remote pole-mounted antenna to receive reliable service. Additional installation fees may apply in these special situations. We will discuss this with you prior to installation so there are no "unpleasant surprises" when you receive your first bill. Click here for a no-cost, no-obligation site survey. Click here for current pricing information. A. FAST! Depending on availability and the service you choose, we can provide you with downloads of up to 20 mbps (mega, or million, bits per second). This is much faster than most Dial-up (0.02 ~ 0.05 mbps) and even Satellite and DSL service (0.2 ~ 5 mbps). Q. How much data can I use per month/day/etc? A. Our service is unlimited. We do not place any usage restrictions (data caps) on our service. You can use it as little or as much as you want, 24 hours a day, 7 days a week. We also do not reduce your download speed after a certain GB per month, or charge extra based on usage. Your monthly bill will always be the same no matter how much you use. A. This depends on the number and type(s) of devices you'll be connecting to our service. If you wish to only connect one desktop computer, the computer will need a NIC (Network Interface Card). Most newer computers come with a NIC pre-installed, and they are readily available at local retailers. We can assist you during the installation of your service. Installation involving wireless devices (laptops, tablets, phones, etc), or two or more computers, requires a router. We can supply a router if you do not already have one. The router connects to our modem and "splits" the internet connection to multiple devices, and provides the Wi-fi signal for your wireless devices. Q. Why do I need an antenna and modem to get your wireless internet service? My computer already has wireless; can't I just use that? A. No. This is a question we hear all the time. The term "wireless" is somewhat ambiguous, and some explanation is necessary. The wireless adapter built into your computer is Wi-Fi compatible (also known as 802.11-a/b/g/n). This is a short-range wireless technology, using low-power signals designed to provide network access within a building or small area (usually about 100-300 feet). The signal is transmitted from a Wi-Fi router or access point, which needs to be connected to an internet provider. In contrast, our wireless system uses high-power signals, on different frequencies, to deliver service over long distances from our towers (up to 15 miles). An outdoor antenna and modem are required to receive our signal. Even if you were close enough to a tower to receive the signal without an outdoor antenna, your computer's Wi-Fi adapter "speaks" a different "language" (protocol) than our tower, and on different frequencies, so they have no way of communicating directly with each other. A. Not usually. The reason satellite service is sometimes problematic is that the signal is being received from a geostationary satellite in space. This signal must travel about 44,000 miles round-trip and must pass through Earth's atmosphere before it reaches you. During bad weather the signal also has to pass through dense cloud systems in the atmosphere, which potentially distort and attenuate the signal before it is received. 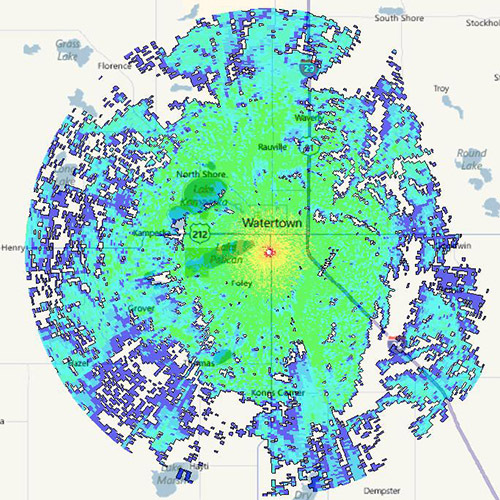 In contrast, our signal is delivered from terrestrial towers located in and around Watertown, SD and travels in a path parallel to the surface of Earth. The signal has a much shorter trip and does not need to pass through the upper atmosphere, therefore it is much less likely to be affected by weather. A. The first step is a site survey. Click here to place a request. One of our professional technicians will check your location for sufficient signal strength and suitable installation options. We'll discuss our findings with you and hopefully schedule a time to install your new Internet service.